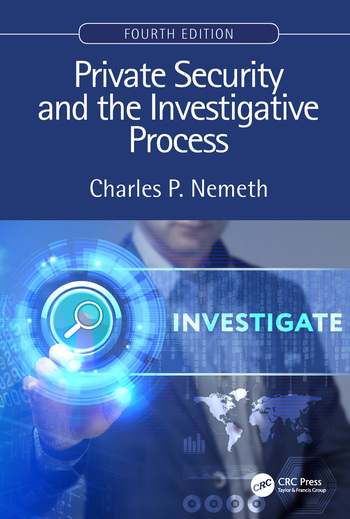 Private Security and the Investigative Process, Fourth Edition is fully updated and continues to provides complete coverage of the investigative process for private investigations by both individuals and in corporate security environments. This edition covers emerging technology, revised legal and practical considerations for conducting interviews, and new information on case evaluation. Authoritative, yet accessible, this book is one of the only textbooks dedicated to the subject. It also serves as an important reference for private investigators and security professionals. Complete with numerous forms, checklists, and web exercises, it provides the tools and understanding required to conduct investigations that are professional, ethical, and effective. Charles P. Nemeth, Chair and Professor in the Department of Protection Management at John Jay College since 2011, has spent the vast majority of his professional life in the study and practice of law and justice. A recognized expert on ethics and the legal system, appellate legal practice and private-sector justice, he also is a prolific writer, having published numerous texts and articles on law and justice throughout his impressive career. His most recent work includes three titles: Criminal Law (Prentice Hall, 2003), Law & Evidence: A Primer for Criminal Justice, Criminology, Law, and Legal Studies (Prentice Hall, 2001) and Aquinas in the Courtroom (Greenwood and Praeger Publishing, 2001). Dr. Nemeth is a recognized scholar in the world of private security. His Private Security and the Law, third edition (Butterworth/Elsevier 2005) is regarded as a treatise on the subject. In addition, his Private Security and Investigative Process (Butterworth/Elsevier 1999) is deemed required reading for security practitioners. An educator for more than 30 years, Nemeth's distinctive career in criminal justice is founded on an exemplary education, including a Master of Laws from George Washington University, a Juris Doctor from the University of Baltimore, and a Master of Arts and Ph.D. from Duquesne University. In addition, he was awarded a M.S. from Niagara University and received an undergraduate degree from the University of Delaware. He holds memberships in the New York, North Carolina, and Pennsylvania Bars. At John Jay University, Dr. Nemeth is Chair and Professor in the Department of Protection Management as well as Director, Center for Private Security and Safety. His previous academic appointments include Niagara University (1977-1980), the University of Baltimore (1980-1981), Glassboro State College (1981-1986), Waynesburg College (1988-1998), and the State University of New York at Brockport (1998-2003), California University – Pittsburgh (2003-2011).